The Free Diagnostic Pathology Software Project arose from the NHS Improvement’s Lean Histopathology Project in the UK. Histopathology laboratories diagnose diseases, particularly cancers, by examining the appearances of the cells in samples of tissue. 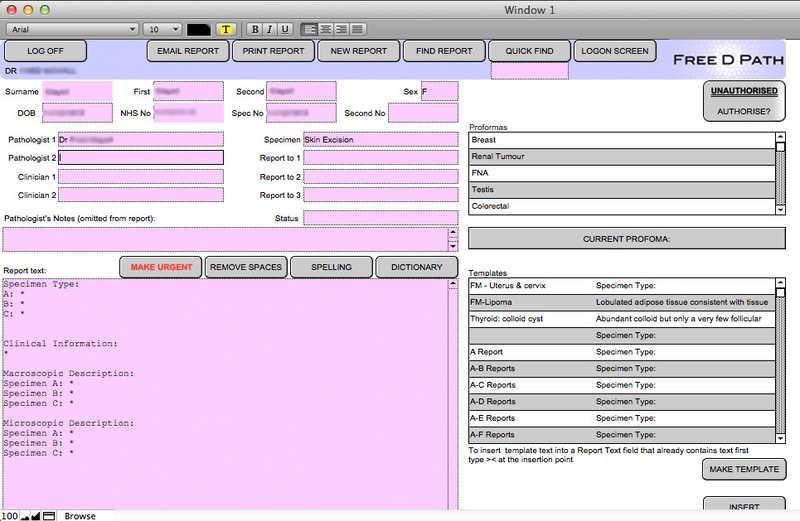 Many histopathology laboratories are using antiquated reporting software. Upgrading to a more modern system is expensive. Even the more modern systems often lack the technology needed for pathologists to efficiently report complex cases allowing workflow to be visually managed and supporting the use of customisable templates and proformas. They are often difficult to use across multiple sites. We have developed web based reporting software that overcomes these difficulties. This has been used to report thousands of cases; many complex tumour cases requiring key data element capture. We used Lean principles to enhance work flow and improve accuracy. You can read more about the project in the related QIPP report. Free D Path in 2014 won an award in the category of ‘best use of IT to support clinical treatment and care’. Now an interview with the projects' founder Fred Mayall was published at EHI news. Read more at "An open path to success"